Staring at a blank page… it’s begging to be filled. Words and punctuation are only symbols. They mean nothing until they’re translated into something more. Not just another code – spoken words… or sounds - but into pure energy. Words are transformed by decomposition, decompression and decoding into flows of energy manifested in thoughts and ideas. Feelings and emotions can be created as well, as the never-ending cycle of energy transformation continues. Backwards as forwards, energy flowing from thought into word is transferred into stored energy. Spoken words, or symbols of sounds, may be transmitted to one, to thousands, to millions. Indeed, this energy storage and transmission is not “renewable,” it’s inexhaustible. As the symbols and codes exist, so too does the power – readily available to be converted again. And again. The collected wisdom of mankind is available and ready; be it via known languages or long forgotten tongues, the energy is there, waiting to be released. With the new age of technology and the pace of development in today’s world, the accumulated energy is so great that no one person is able to release it all. But imagine if one could… to have all that collected wisdom – the discoveries, the inventions, the creations – it boggles the mind. However, what if... what if technology could release that power? What if the power in those words and works were available, in an instant, to all who sought it? Could it be that the questions of all time, the riddles and the puzzles are already solved if one only had all the known information? I have often wondered about magic. Fairytale magic, witchcraft, sorcery, incantations, natural, spiritual, scientific or physical – I don’t care – just magic. Why? To get “there” faster? Yes, there was once a time. To solve unsolvable problems? Sure, mine as well as yours. To make the world a better place? I’m not sure even magic alone could do that. To accomplish the impossible? To travel to the ends of the universe or… to travel to another one? Would magic be able to produce answers? Could it be an aide to finding the solution, or would it render the solution moot? So, I have come to some conclusions that are, of course, subject to change without notice. First, there is no “Harry Potter,” magic wand brand of magic. 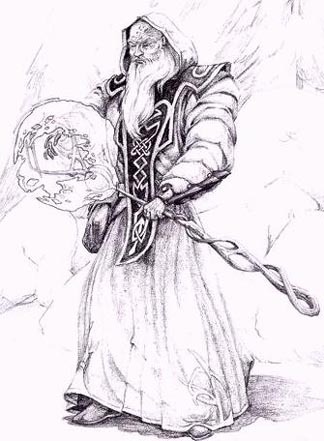 That leads to several other conclusions that are similar regarding witches, warlocks, vampires, alchemy and a host of the other “classical” views of magic. I could be wrong, but the evidence as I see it is overwhelmingly lacking. 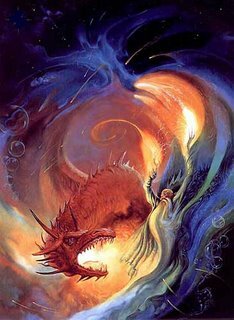 However, the term “magic” is subject to interpretation and with a sufficiently accommodating definition, magic is very real indeed. It operates continually and forever. It cannot be extinguished or exhausted. It is pure power. The energy that goes into and flows from words, coded from thought, born of magic. Pure magic. Whether it is defined by the electro-chemical nerve impulses firing from one nerve to next one ad infinitum or the vastness of all we have yet to learn or the miraculous progress we have made in the last ten, 20, 50, 100 years, magic is present. And it all stems from a means of translating the energy from one to another – of conveying the power that we as humans possess alone – the transmission and storage of unlimited, unbridled and unimaginable power. As promised, here are the links to my published work this week. Although this is a defining moment in my career, the fanfare that comes with it is due to the novelty - the achievement of a goal that marks a milestone along this journey. This event - published work - will be repeated every week for at least the next several weeks. Ideally, the quality will be improving as well, but it is only this one time that can be the first. It is for this reason that I am celebrating them so prominently here. 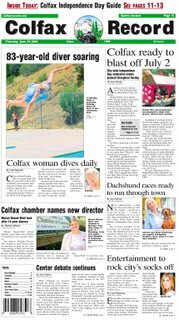 In the coming weeks, one may stop by the Colfax Record’s website to find a number of my published stories – I won’t be announcing them all here. Of course, if there happens to be some news of more universal significance, I may mention it. If I write a column that has more than just local appeal, I may note it. If I write a piece that garners recognition, stirs controversy or is in anyway noteworthy, I will send out the alert. I expect that most of what I write will be of the goings on in the small Sierra foothill community of Colfax. This assignment is designed to give me real world experience, not just in the writing, but also from the reading… or rather, the readers. Real people that are directly affected by what’s happening in their community and the role I play in delivering that news to them. It is not a little deal. This week, I wrote a straight news story about the Chamber of Commerce hiring a new executive director. I was in the office no more than 30 seconds when I was assigned this story. Although not extremely long or involved, I was surprised at how much work and thought went into it. Click here to link directly to it. I also wrote a column in which I introduce myself to the readers of the Record. This was right up my ally… it’s the sort of writing that I do best. I hope to be able to write these pieces regularly. It appears as though there is a good chance. To read these 800 odd words (give or take), click here. To link directly to the paper, click the title of this post. It prints every Thursday, but the online version is published Wednesday evening. This is going to be a crazy summer. Let the games begin! It’s odd sometimes; the boom and bust cycle and the layers of components that make it up. Time, inspiration and motivation can work together, in perfect synchronicity or they can completely negate each other. Then throw on top of all that the sensation of whether one is productive, lazy or even lucky and how those sensations affect and are affected by the first three factors and one can end up very confused indeed – which, of course gets blended in as well. And as complicated as it seems, with just seven factors to consider (causal: time, inspiration, motivation; effectual: productive, lazy, lucky; and resultant: confused) it is but a mild representation of the complex interaction of everything and everything else. Of late, it has been an unusual combination of factors that has perhaps produced this odd insight. Time was extremely tight for a few days and then suddenly – not so much. While time was limited, a kind of motivational force was produced… grace under fire that did not require any particular inspiration. The work was defined and although original work had to be created – it was along a concise framework, one that came with a firm deadline. Perceptions of laziness were nowhere to be found – productivity is abundantly evident and there are blessings to be counted. All was in order – everything reinforced everything else. Indeed, there was not much to think about. Stories are coming at an alarming rate. None, however, have made it into print and many are quite possibly gone forever. And others? Maybe just on the literary “back burner.” The fact is that there is no one ”waiting” for them. Oh, sure – in the figurative or spiritual sense there is always “someone’ waiting in the great scheme of things, but there is no deadline. If these words don’t see the light of day, no one will be the wiser. The only direct downside is to oneself in how it affects one's feelings of luck, productivity, laziness, etc. Then the cycle spins, in turn affecting the physical reality until something pops; this time manifested in confusion. Too many “whys,” a few “ah hahs” and an “hmmm” or two finally yielded some action. Action manifested as written words that, ironically enough, are born of inspiration triggered by the very confusion that spawned the questions that instigated the action that started it all in the first place. Whew! All leading right back to the very confusion that started the questioning that led to more confusion. And that’s the simple version! All this from just seven quasi-randomly chosen attributes to toss into this cyclical stew. Even more curious is that all this revelation has not lessened the confusion in the least. However, the sensational laziness is greatly diminished; the productivity is back in the “boom” cycle; motivation is up; inspiration - enhanced; time is still available and luck is there. Everything else? – It’s everything elsing. And the confusion mounts. As inter-related as all these and infinite other factors are, they can and apparently often do have nothing to do with one another. The push/pull, action/reaction… chickens and eggs are only window dressings – except when they’re not. It’s enough to inspire and sufficiently motivate one to make the time to take a nap, producing lazy sleep to dream about how lucky one is to be confused. Much to my amazement, it has been four days since I have produced anything to fill this space. Although I have spent some small amount of time reading my regular blogs – and even less commenting, even that has fallen off this weekend just now coming to an end. Of course there is a perfectly reasonable explanation – part of it I’ll share, right here, right now. And part of it I won’t, not yet anyway. I am in summer school at Sac State. I’m enrolled in three units of Spanish reading proficiency (yuk) and another three units of journalism internship. The Spanish is compulsory… I have to take it to graduate and the internship is… exhilarating. I just started writing for a small paper in the Sierra foothills and it is keeping me plenty busy. It is a weekly and publishes on Thursdays. I will have a couple of pieces published this week. Don’t worry, I’ll remove the mystery and provide the links and all once it hits the streets. Just know that, for now I am very busy and happy as a pig in… mud! PS: For those of you that must know what the “other” reason for my absence is, feel free to email me – it’s not a huge secret, I just don’t want to go into it right now. I grew up in a small town. It is part of the greater San Francisco/San Jose metropolitan mega-city, but it had and still has an identity – a charm uniquely its own. Most (but not all) of the cities and towns between San Jose and San Francisco can make this claim even though one would be hard pressed to define the end of one municipality and the beginning of the next. Like the Los Angeles basin, all of these different governmental units have physically grown together, but still maintain some kind of identity all their own. Some of that distinctiveness is passed down through tradition, some by way of the architecture, history, family legacy, etc. These small towns often are characterized by a city center or a “downtown” that is usually rich in cultural history. Perhaps there are annual events such as a Forth of July pick-nick, the local high school home coming parade or the Christmas Tree lighting ceremony that celebrate municipal unity. In the small town I grew up in and others in which I have resided since, these and other similar events provided the glue that bonded the neighbors and neighborhoods alike. It is impractical as well as unrealistic for the local “major news outlet” to cover such events; time and space do not permit. The San Jose Mercury News and the San Francisco Chronicle are not in the business of covering the minutia that occurs in every small town in its coverage area. These newspapers should leave this type of news reporting to the appropriate stewards – the local weekly newspaper. They do more than just cover the newsworthy events that are important to the locals; they help to promote the civic aura that helps to define a town’s character. The small town weekly will only report on statewide, national and world events as they apply to the town it represents. For instance, if a local kid is injured or killed in Iraq, the small town paper gives a name, a face and a family to what would otherwise be nothing more than a number worthy of a sentence at the most in the major metropolitan newspaper. The small town paper reports the local school’s honor rolls, noteworthy achievements of the town’s residents and advertises local businesses. The employees of these papers often wear many hats and are driven as much by passion as they are by pay. Indeed, often these efforts are of a voluntary nature. When I was a kid, few “jobs” were available to those under the age of 13 or 14. Those that were consisted of baby-sitting, mowing lawns, dog-walking and house-sitting. These jobs were nice for earning some pocket change, but to earn any “real” money, there was one other option: Paperboy. When I was a kid, these jobs were highly coveted and did not see much turnover. Typically, a kind of retirement occurred at around the age of 15 when a work permit and a regular, part-time, minimum wage job flipping burgers at a fast food restaurant or pumping gas at a gas station (before self-serve), etc. became the preferred form of employment. Every Wednesday afternoon, my papers were delivered in my driveway and after school I would start to fold, band and bag them. It took two trips to complete my route and for my efforts I earned what seemed like a considerable amount of money. I don’t remember how long I did that gig, but even way back then, the local paper in my town and countless others were dying a slow death. It was not long before it folded up all together. I was able to get a route for a daily paper in the somewhat larger nearby town of Palo Alto. It published six days per week (not on Sunday) and was the “main” newspaper at a time when the San Jose and the San Francisco dailies (there were two in SF at the time) did not pay much attention to the mid-peninsula. I was able to acquire the route next to the one my street was on. Within a few months my “home” route opened up and I was handling two routes totaling well over 100 newspapers, six days per week. It paid pretty well and kept me busy every day after school. Sometime during my tenure, the San Jose Mercury started to offer daily delivery up and down the peninsula (the San Francisco Chronicle already did in some areas). Those poor unfortunate paperboys had to be up at or before the crack of dawn to deliver their papers – and deliver a huge Sunday paper. I don’t know if any saw this “big city” invasion into suburbia as a harbinger of things to come, but it was. While delivering the Palo Alto Times… actually while folding them for delivery, I started to read it. I never really bothered to read it or any other paper before, but the Times almost immediately captured my attention. In fact, many times I got so engrossed that my customers would complain about late papers. It was a passion that I hold to this day. Although my hands don’t get nearly so black from newsprint as they did in those days, holding the paper in my hands while reading it lends more than just familiarity and nostalgia – it breeds a sort of authenticity. It has a character that I have so far not been able to capture from computer generated on-line news. Unfortunately, the Times’ days were numbered too. The Times and its sister paper, the Redwood City Tribune, were purchased by the corporate parent of the Chicago Tribune, the Tribune Company and merged into one paper – the Peninsula Times-Tribune. It was all downhill from there. The purchase and merger happened towards the end of my career there and the paper managed to hold on for a few more years. However, when the Tribune Company tried to sell off the paper and could not find a buyer, it simply shut the paper down. The paper, with its 100-year history has been silent ever since. Although many of these small local papers have been pushed into oblivion by the corporate giants; and many more have had to make major adjustments just to stay afloat, there is a resurgence of the local news provider that can’t be ignored. In my own hometown and in Palo Alto, new publications have risen from the ashes of their deceased predecessors. They provide local coverage of local events and advertise local business. Additionally, it would appear that in many cases, local control has been maintained – they are free of corporate cost cutting and business planning from executives 2000 miles away. They are once again in the news business, not the business of news. I have resided in my current home for just a little over a year. This neighborhood could be considered upper-middle class, although these sorts of labels never meant much to me. People are people and I could get along pretty much anywhere. Having said that, however, it would be misleading to imply there aren’t certain inherent advantages to living in this kind of neighborhood. It is also true that there are some disadvantages, and how one fits in with the “look” of the neighborhood can shed some light on these factors. The crime rate here is low. There is no poverty nearby; there are no have-nots in this neighborhood. Therefore, those inclined to less than honorable means of sustenance are not in the immediate area. Furthermore, the home values are not deflated by the intermittent unkempt property. Those that have attained this level of success are statistically better educated. They don’t generally have “jobs,” but rather, careers and can afford the price of living here. My path here was somewhat unusual, but some of these descriptors apply to me too. There is, however, a darker side to this apparent wealth. All this higher education may have increased the collective enlightenment, but it is not apparent in the character of the neighborhood. Indeed, this neighborhood has very little character at all. Although “outsiders” are viewed with caution bordering on suspicion, the determining factor as to who is an “outsider” is not familiarity. It can’t be because no one here knows each other let alone who an “outsider” is. Therefore, if one has not the stereotypical look of an upper middle class suburbanite; if one does not drive the appropriate and appropriately new automobile; and if one fails to conform, then he is viewed through a different filter. The picture posted here represents a contradiction and the contradiction goes well beyond the surface. It was taken last August after I was settled in and was the second occasion I had to throw a party. This one happened to be a birthday party for a friend and approximately 30 guests were in attendance. 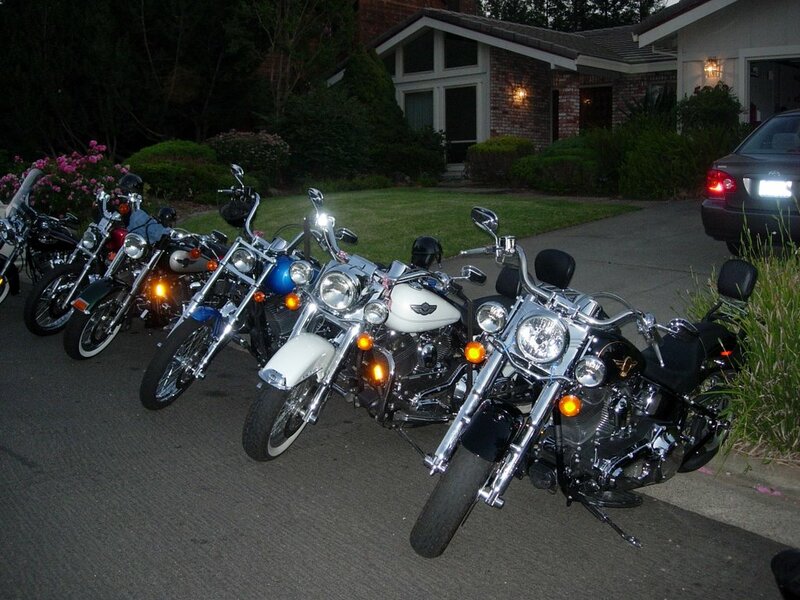 As one can gather from the photo, many of my friends are motorcyclists. Our machine of choice: Harley-Davidson. Regular readers of this blog know how I feel about riding in general and riding Harleys in particular. My neighbors don’t… or at least they didn’t (I think they do now). These are not inexpensive motorcycles. The least expensive has a value of over $10,000 with the most expensive probably topping $40,000. These guys (and gals) represent white collar and blue collar alike. They are all highly skilled professionals and make a considerable amount of money. It is something they have in common with my neighbors, although my neighbors probably don’t have a necessarily wide enough field of vision to see it. Just as one doesn’t come to live in an area such as this by taking advantage of society, so too is it true that one does not enjoy such an expensive “hobby” with the same anti-social values. 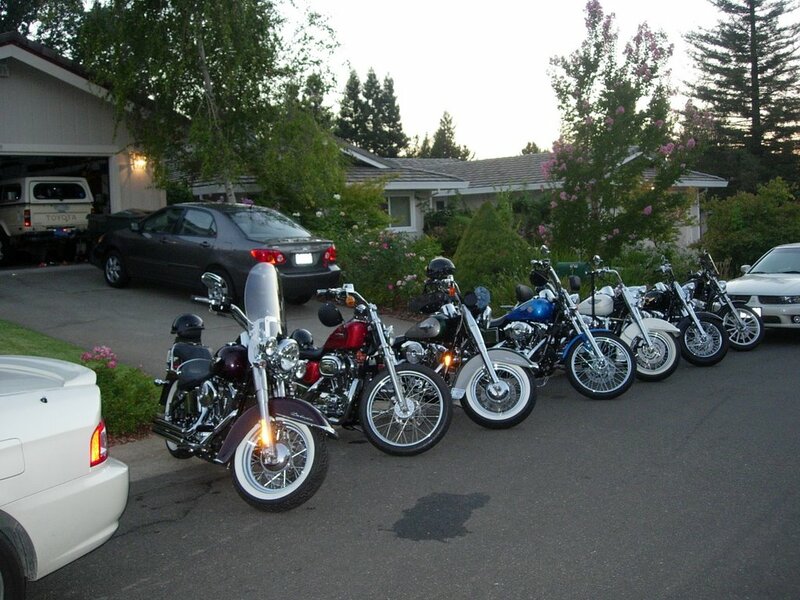 Many of my neighbors only see the black leather, tattoos, shiny motorcycles with lots of chrome and at least one hold out (me) with long hair and they equate that to the Hollywood stereotype of the “outlaw” biker and the motorcycle gangs of the big screen. Although these do exist, they are among the extreme minority and are rarely seen is out in plain sight. The last place they would be found is in front of my home - or... out on the golf course. That’s right, some of them are avid golfers too, maybe playing right through my neighbors foursome! I hold no animosity towards these hard working, affluent, social isolationists. I feel sorry for them – they are prejudging the richness of community right out of their lives. They are, to me so far, harmless. Only once has the cops been called on me and it didn’t amount to anything more than embarrassment for my next-door neighbor. Her preconceived idea about who I was clouded her judgment – and the sheriff’s deputy was happy to explain that to her. Today, a year later, my neighbors actually do know at least one of their neighbors - me - by sight if nothing else. And they know that I belong here… and that from time to time there might be a motorcycle or two or three and sometimes more rumbling up the street. And they know that it’s ok. And maybe, just maybe next time they will step out of that suit of armor they feel the need to wear and risk acknowledging that they just might not know what they think they do. With Father’s Day just three days off, and since I have a few idle moments to while away, I thought it would make sense to explore fatherhood from the two angles that I am experienced in – father and son. They are decidedly different views of the same institution. There are contextual differences in regards to time and the cultural evolution that the passing of time brings. There are the perceptual differences of viewing the world through a child’s eyes, an adult’s eyes and the eyes of a father. Finally, there are vast differences in personality in regards to the paradigm one operates under and all these and other factors influence it. My father grew up in a completely different time. Not just in a generational sense, but a generation that has seen unprecedented change across the entire spectrum of human history. His childhood only remotely resembles mine. In some respects it was perhaps better and in others maybe worse, but it doesn’t do to compare levels of quality, only to note that the differences are obvious. He is an only child and was raised by older parents that emigrated (legally) from Eastern Europe during the Bolshevik revolution of 1917. He was born during the Great Depression in New York City, moved to Miami in his teens and finally Southern California - all before the end of his teen years. My grandparents were working class, worked very hard and provided as much as they could, but it was not much. My Dad would be the first to tell you that he was not the smartest student, yet he excelled in school, skipping two grades before entering the University of Miami at 16. He believes that he was able to accomplish this and other significant achievements by working harder than others. I think he may be selling himself short. There is no doubt that he worked very hard to get where he is, but I think he’s a little smarter than he lets on. I understand what he means though. Being lucky or smart amounts to nothing without effort. It’s still true today and but one of the many places he and I used to differed in our perceptions of life. Thankfully, I have come around to his way of thinking in at least this respect. He continued going to college after moving cross-country with his parents and everything they owned in 1952. He entered UCLA as a junior at the age of 18 and graduated two years later with a Bachelor of Science in chemistry. He then joined the US Army for a two-year stint before returning to school in pursuit of a Ph.D. at USC. His actual reason for returning to school, however, was to get out of the army two months early. Therefore, it was not long before he left USC to take a job at Rexall Drug. It paid $400.00 per month - a significant amount of money at the time. After being passed up for a promotion by someone who was less qualified but had a Ph.D., my father decided that if he was going to succeed as a working chemist, he needed some initials after his name. He applied and was accepted to Stanford University’s graduate program in 1957. He managed to put himself through grad school just as he had in his undergraduate years and in 1961 he earned his Ph.D., putting initials not only after his name, but before it as well. He then returned to Southern California to work for the Richfield Corp., met my mother, got married and moved back to the San Francisco Bay Area for a new job, one he kept for many years. In December of 1962, I came into the picture – my Dad became a father and my Mom a mother. In November of 1964 my brother came along and by September of 1966 I had a little sister. By this time my parents had settled down in a sleepy little town near Stanford University. This part of the Santa Clara Valley used to be known for its fruit orchards but is better known today as the Silicon Valley. It is the home I would spend the rest of my childhood in and the same home they still live in today. It afforded me the stability of attending the local elementary school, junior high school and high school all without ever moving or changing school districts. That sort of stability was rare in those days and an even greater rarity today. Furthermore, any aspirations I may have had for higher education were encouraged and supported, financially and otherwise. My mother was a “stay at home mom,” better known as a “housewife” in those days and my father was a professional working long hours to not only provide for his family and get ahead, but stay there. In his childhood years, his parents were not able to provide that sort of financial stability and I am quite sure my Dad was intent on not having to live that way ever again. In that respect there is no doubt that he was successful; through hard work and education he never had to worry about where the next dollar was coming from. We did all the family stuff that the typical or stereotypical middle-class suburban family does. We took a summer vacation virtually every summer. Some were to Southern California where most of our relatives still lived. While there we would go to Disneyland, Knott’s Berry Farm, Hollywood, San Diego, Tijuana and the beaches. Then there were camping trips to the redwoods – Plumas Eureka State Park, Portola Valley, and Big Basin. There were even a couple of winter trips to Lake Tahoe, though neither of my parents had any particular fondness for the snow. We did the family and neighborhood summer bike rides downtown to the ice cream shop, Fourth of July block parties and Boy Scouts. My Dad, from what I can determine, did not have a great deal of this kind of experience as a kid himself. Although the times, the places, and the circumstances were all different, somehow he was able to bring to the table what was needed for an absolutely a golden experience for any kid. That I was able to find any fault in this upbringing is only an embarrassment to myself, not any fault of his or my mother’s. They went above and beyond, yet I am positive that they didn’t view it as anything more than doing their job – a job I am equally sure they did not out of obligation but love. Things changed when I hit my teen years. Not just the family dynamics, but the social fabric of the entire nation was redefining itself. The seventies and the eighties were a time when the country was trying to deal with the fallout over Vietnam, the civil rights movement, women’s liberation and, of course, Watergate. It was a period of rapid social change and one that left some in my generation somewhat confused and many – as was true in my case – very apathetic. A combination of factors left me with a sense of entitlement that would have me chasing the quick fix for a very long time. Even if I had come with that proverbial “instruction manual,” my behavior would not have been covered in the “trouble shooting” section. In some respects my siblings followed my lead and in others they blazed their own trail and all the while all hell seemed to be breaking loose in so many families, yet everyone was in some sort of collective isolation; no one knew what to do and no one was talking. Fast-forward 25 years. I am now a father of three young adults. My boys’ childhood is as different from mine as mine was from my Dad’s. The stability that my parents worked so hard to achieve was nowhere to be found in my kids’ life. It’s as different as night and day, yet there are those constants that perhaps don’t become apparent until one gets to experience them from the other side. Among them is that my love for my children is as unconditional as my father’s is for me. Another is that all I want for my kids it for them to be happy. I have discovered that no matter how much I want to, there are things that I cannot give them. Things like self-esteem and pride can’t be bought, they can’t be found and they can’t be won. They must be earned – they are the rewards gained only through action. And I can’t do it for them – it’s so very simple but a revelation all the same. It is with new perspective and deep appreciation that I acknowledge all my father has done for me. He and my mother have sacrificed as I have – more - and what I know today is that the sacrifices I made as a father were nothing of the kind. That is, “sacrifice” is not the appropriate word. And although it has been at times both very painful and wonderful – often at the same time, it is part of the job and one I would (and probably will) do again without hesitation. I suspect that my parents feel the same way; in fact I know they do. I don’t look at what I am giving up, but what I am giving. My Dad said to me once, not too long ago, that his appraisal of fatherhood is not measured by how successful his kids are and not by their level of education or other accolades and awards, but by their values. All those other things are dandy sources of pride, but pride does not equal satisfaction. In other words, if his kids have integrity, honesty, humility, dedication and a host of other similar qualities, then he has done his job well. I agree and would add that if my kids are generally happy… if happiness is their static state, then I have done my job well. Those qualities my Dad mentioned are the other side of the same equation. They are two forms of the same thing, as matter is to energy, so too is happiness to integrity. If indeed that is the measure of a good father, then my Dad measures up! It is safe to assume that as one progresses through life, one’s interests evolve. Some are outgrown, some hit a plateau in that they no longer hold any interest and some just fade away over time. I am not just discovering this, nor is this the first time I have dwelt on this phenomenon. I am fully aware that I can be somewhat compulsive and obsessive and that my attention can be disproportionately diverted to these pursuits. Although not always or even frequently unhealthy, these “hobbies" (for lack of a better word) do represent large amounts of time in the learning and practicing of the given art. I am fortunate to have had the opportunity to explore a number of areas of specialized interest. Among the more recent are: Skiing, snowboarding, weight lifting, boating, four-wheeling, computers, machining, automotive performance and bicycling, just to name a few. Some have been of a longer duration than others and some are in “cold storage;” they have not been officially retired and I intend to pick them back up when circumstances permit. Some were intentionally pursued and others came by way of happenstance. Once a particular interest has captured my attention, I’ll do what is necessary to become an expert – including further formal education if necessary. None of that has anything to do with what follows except that it’s a dandy segue to a story that involves the confluence of two of these hobbies. Overlap was not uncommon especially if a particular season was involved. There was a time when boating and four wheeling were prominent activities of mine. Boating, in the fresh water lake and reservoir or “trailer boat” sense, predated my interest in four-wheeling and was an intended pursuit, there was not much involving chance. The four-wheel drive truck obsession sprang from the unplanned acquisition of a four-wheel drive vehicle and grew from there. Around 1991, I bought a little 13-½ foot runabout with a Mercury 65 outboard motor. The boat was around 20 years old and the motor, built in 1967, was even older. I had owned the boat for about ten years and it was getting very close to the end of it’s life – and what an end it enjoyed. That boat was on the water almost every summer weekend - it probably ran more hours during my ownership than it’s entire previous life combined. The boat was sold for chicken feed about six years ago and my boating “phase” has been in cold storage to this day. The four-wheeling phase sort of blind-sided me. Although somewhat muted, it is still with me today. In fact, I still own one of the trucks in the following story. It is unfortunately (or not with the price of gas) in storage. Today I drive an old (1983) Toyota SR5 4x4 everyday. It has 225,000 miles on it and still runs strong. About 1999 or there abouts, however, I was driving a 1994 Explorer and I also owned (still do) a 1980 Chevy K30 dually. The Explorer was stock, but the Chevy was (is) anything but. It’s a big, thirsty monster and I didn’t drive it very much. I was living in Truckee, CA at the time and late one summer – the weekend after labor Day – some friends and I met at Rollins Lake near the Sierra foothills town of Colfax to do a little camping and boating. With my boys, some friends, the camping and boating gear – and the boat, I decided that it would be best to drive both trucks, towing the boat with the Chevy. The Explorer had the seating capacity and the Chevy was good for hauling gear. My buddy drove the Explorer and I drove the Chevy, of course! It was only about an hour drive and the trip there was uneventful. At that time of the year, after the main summer tourist season is over, the lake is lowered for maintenance, runoff space for the upcoming rainy season, etc. The water was already down quite a bit by the time we set up camp. The composition of the newly exposed shore is mud. Slimy, thick, gooey, gummy mud. It’s the kind of mud that squeezes through your tows like in a Play-Doh Fun Factory. Fortunately the launch ramp went well into the lake and had plenty left to go. I usually would just beach my boat. I wasn’t concerned about scratching the hull and it was small enough to pull the bow up onto the beach. In the mud, it wasn’t necessary to pull the bow up to beach it, but it was to release it! The mud held it tight. We didn’t really notice the water receding during the day, but by the next morning the lake had dropped at least a couple of feet – enough to leave my boat almost high and dry. This is not usually a problem, but because the mud lent no traction to push it and because it sucked the hull down so completely – we could not budge it. Finally, after about an hour with three of us pushing, pulling, scooting, shoving and of course slipping, we finally freed her from her muddy trap. It wasn’t until later that day we were informed the water is only released at night – that’s why we didn’t notice it receding during the day. The rest of that day was spent boating, basking, tubing and barbequing. I did not make the same mistake I had the prior night – I put the boat on its trailer. The next morning, after re-launching the boat, our neighbor down the shoreline was having his own problems – not with being stuck, but with a dead battery. I determined that the best way to help was with my monster Chevy and its dual battery setup and my industrial grade jumper cables. I would drive the truck right down to the water’s edge so that the cables would reach the stern of the boat and her battery. What about the mud? No problem – remember, this truck is a monster. It has 36 inch Super Swampers – the de facto mud tire of the time, heavy duty everything and a track record of never being stuck - never. Ok, ok - once! That Sunday in mid September made it twice. After successfully jump starting the boat, I put the truck into reverse and hit the gas. The engine roared (did I mention that this truck is heavily modified?) and the tires spun, the mud flew and the truck didn’t move. Ok, I just have to rock it a little, ease on the gas and pull right out. Nope. I tried gunning it – nothing. All it was doing was digging a deeper and deeper hole. And the crowd started to gather, which is usually an invitation to show off, but not this time. Little did I know that the embarrassment was not yet complete. Well, either that Chevy was stuck like the boat the day before or the mud was deceptively gooey just under the surface 100 feet up the bank – probably both. The Explorer spun its wheels and slid sideways towards the left and down hill towards the lake. Quickly determining that this was not going to work and not wanting to get the Explorer stuck as well, I decided to abort and disconnect the truck. I no longer cared about saving face. And the crowd grew; one had a video camera. After disengaging the tow strap, I nonchalantly jumped into the Explorer to drive it up to terra firma. It had other ideas as gravity assisted the mud in pulling it along the lakeshore and ever so slightly down towards the water, No amount of coaxing would allow it to travel up and out of danger. Now I had one truck hopelessly stuck and another that was not officially, but may as well have been. I also had a crowd of onlookers numbering around 25, most of them looking very amused. My friends were in absolute hysterics. Me? I did not find it the least bit humorous. One on-looker with an old, beat-up Ford two-wheel drive truck offered to help. The Explorer was close enough to firm ground that the tow strap would allow the Ford to pull it up. Besides, it wasn’t exactly stuck yet, it was just slipping downhill. For the Chevy, that same two-wheel drive Ford truck with the addition of a chain attached to the tow strap to lenghten it allowed it to pull the Chevy out too. As it turns out, once released from the hole I had dug and with a tiny bit of momentum, I was able to power it out creating an impressive spay of mud for about 100 feet. Ah, yes - salvation! This all happened when the TV show “Americas Funniest Videos” was all the rage. The top prize was a significant amount of cash and I expected to not only see that video on TV, but for it to probably win. I don’t know whatever happened to that videographer or the tape. I do know that it is one of my cherished memories – the weekend I got my boat and both trucks stuck in the mud at Rollins Lake. It’s getting a little easier. Deleting is. Deleting words that are already written has always been a difficult task. It’s as though they somehow represent something greater – they almost become alive. Yet, they are just words. Profound, gibberish or somewhere in between they don’t mean anything unless they’re read, and those just deleted never will be. The context can’t be recreated, even if remembered verbatim. Although the words can be reconstituted, what they were born of is gone. Inspiration is a fickle thing. It comes and goes and when it goes, it’s gone. Forever. Sure, similar thoughts and words may be born of similar circumstances, but the ones deleted are gone for good. For good? Yes. That could be how it should be viewed. Not all things are meant to be. Even the thoughts represented by these words and the motivation they were born of could be better served by different words and more pronounced experience. This historic vision of the frustrated writer no longer applies. The yanking, crumpling and tossing have been replaced with the stoke of a mouse and touch of a button; the waste paper basket replaced with an icon on a computer screen. No muss, no fuss. With a couple of mouse clicks, the garbage is disposed of permanently, in a very eco-friendly manner. The frustration, however, remains. It takes practice to delete. It doesn’t get easier per se, just more familiar. It is a necessary evil. As difficult as it is to turn back when realizing the direction chosen leads nowhere, so too is eliminating from existence words already composed. But like hitting any dead-end, backtracking – or deletion – is part of the progression. Sometimes knowing the wrong direction is part of knowing the right one; knowing where to go might mean knowing where not to. And the basket fills; it is overflowing with deleted work. Wasted effort? Not even remotely. It is part of the experience, an integral part of the creative process. It is separating the wheat from the chaff. And today, the ease of deletion in some respects makes it that much harder. The time and effort to create can be erased so completely and effortlessly that it’s value feels somehow diminished. No paper, no ink, no evidence of ever existing remains. The memory lives in the words that survive, each of them rising from the ashes of their deleted brethren. It’s 5:28 a.m. and I’ve been up for about an hour. I just finished writing a new installment on my fiction blog and the sun has started to cast its grey early morning shadows on a new day. Wednesday. Mid-week and it will be a busy day. Wait, perhaps I should rephrase that; it sounds too dark and I don’t mean it that way. It’s going to be an eventful day, an exciting day, a day full of opportunity and discovery, by even the most conservative estimation; it ought to be a good day. It helps to go into it that way. An exceptional pot of coffee doesn’t hurt either. Sometimes it just comes out that way. I use the same “recipe,” the exact same procedure everyday, yet some days it’s better than good – it’s great. So is it the magic coffee that has set up the positive outlook? Indeed, perhaps the glass is half full… of coffee! Ok, I’ll quit deluding myself; all will not be smooth sailing today. If I am to be totally honest, I must acknowledge everything – I can’t possibly be this happy. Time to get real. Real what? Real miserable? Not on your life! Here’s the deal, the keys to the kingdom, the magic, the stuff, the juice, the happy pills, the – whatever: Why would I want to bring this optimism crashing down? I am not deluding myself – I acknowledge that there will be challenges today. Personally, locally, nationally and globally there are issues that need attention. Today (which is all I’ve got anyway) gives me the opportunity to address these issues. If I feel that there is no hope, if I am negative right out of the gate, if all I see are problems and no solutions – then I might as well go back to bed… forever. Negativity is a self-fulfilling prophecy. If you want everything to turn to mud, believe it will and it’s guaranteed. There is no chance for success without the belief that it is possible. And anything is possible. Look, I am not unique. Everyone has had and will have challenges to face. Everyone has experienced success and has prevailed over situations that looked completely hopeless going in. Often there was no choice, it was do or die – and we didn’t die. I know I have faced some seemingly insurmountable obstacles and I know of others that have faced even worse – and conquered them. So when viewed in the sunlight of the past, today ain’t nuttin’. Whatever is there, I’ll make it through. The known challenges and the surprises alike, I’m ready. I am not deluded, I am not in lala land and I am not “only fooling” myself. I know that whatever this day dishes out, I have the attitude that allows for success, not the one that guarantees defeat. Today already is a good day. This has been an eventful weekend. Not in a physical sense, nor has it been a particularly mobile weekend; I stayed in town and, for that matter – mostly at home. However, it has been, in some respects, exhausting – no, busy - nonetheless. Furthermore, even though I spent much of this weekend at home, I have interacted with a greater variety of friends, family and acquaintances via a variety of means consistently over a period of time. In short, I have felt more “plugged in” than I do during a normal, busy weekday. Ok, I think that the question then has been successfully set up – why? What gave this weekend the flavor of a hectic work (or school) week? In a word – interaction. And not just idle conversation either (although some of it was just chit-chat), but meaningful, substantive, intelligent and pertinent discussion. It happened with friends, it happened by email, it happened with family members and it happened on blogs. It occurred between good friends that I see regularly and new friends that I have never met face-to-face. It covered a variety of topics and some may even have lasting effect. The revelation is that none of these differences, be it means, topic or relationship, had any bearing on the “ranking” of the discussion’s importance. In other words, each conversation held the same or similar status with me – even the chit-chat. It was an intellectually busy weekend and I feel as exhausted as I do relaxed. An interesting dichotomy in that I believed those two feelings to be mutually exclusive. There was more than just talk, of course. Other forms of non-verbal communication by way of these various vehicles were also apparent. Yes, even through the faceless, silent and often anonymous electronic medium known as cyberspace. “Feelings” can be expressed through text. Through word selection and placement, different understandings and even misunderstandings can manifest themselves. This is not new to me, but does garner my attention occasionally, especially when linked to other events that seem totally unrelated – but the connection suddenly becomes clear. Then there is emotional non-verbal communication as well. It is identification, in real time, with feelings of excitement, sadness, disappointment, empathy and the like. And not a word has to be spoken. Often it could be tied to a physical experience with the very real smells, sounds and sights of an event such as a radio station’s motorcycle give-away promotion. This is not just a hypothetical example of what could be, but rather the story of what was. Although my excursions outside my home were short, nearby and limited, one will stand out for a very long time. Like so many experiences, the greater significance of this one did not hit me until I had a moment to reflect – which happened just minutes ago! After my original plans for Saturday morning fell through, my friend called and asked if I’d like to ride down to Sacramento Harley-Davidson with him. It was a short ride (15 – 20 minutes), but it was also a beautiful, tank top riding Saturday morning. Since I no longer had any obligations, I accepted. I met him at his house and then we rode over to another friend’s to pick him and his son up before all riding over to Sac Harley. The friend who called me had qualified to win a brand new, $30,000 Harley. He was one of just 24 qualifiers, so his chances of winning were pretty good, but still long. There was the radio station’s promo tent and mobile unit, a free barbeque and soft drinks and, of course, a sale. Just after noon, the drawing began. It was a reverse-style, elimination drawing, so the last thing we wanted to hear was our friend’s name. Besides those of us who rode down with him, there were a number of other friends and acquaintances there to participate in the festivities and lend moral support. Although we all jokingly referred to the bike as his in the days before, it stopped being funny when the drawing started and names began to get eliminated – each loser winning a $100.00 gift certificate. After five, he was still standing; ten, still there. Then 15 names were gone, then 20, then after 22 names had been eliminated, he and one other qualifier were left. As one can imagine, the suspense was at a fever pitch. And we were all there with him, feeling his excitement and suspense – ready to celebrate his good fortune… or console him in defeat. His name was drawn next. His consolation prize for second place was the same as 24th, a $100.00 gift certificate. It was almost as thrilling as if my own name had been in that drawing. He and the other qualifiers were not with the rest of the crowd – they were near the radio van and the bike – a beautiful 2006 Harley-Davidson Screamin’ Eagle, 103 inch, limited edition Fat Boy. We were not close enough to converse, but we knew. We could feel his heart beating – we felt his ever-growing disbelief as name after name was not his. And when his name was finally called on the 23rd pull, our collective hearts sank. So close but yet so far, we all felt it with him. Not so unusual perhaps, but the secondary, the “post-traumatic stress” response was equally unified. It was an expression of gratitude. For a hundred bucks? Second to $30K? No, thankful that we were able to take the ride with him, the building crescendo and the fall from the top. The excitement and exhilaration… the disbelief followed by the disbelief. All felt in a single moment; all the same and all together. Isn’t that what it’s really all about? • According to the Blogger Dashboard, this is post number 102. There are a couple of posts that are saved as drafts, so I’m not sure if they are included or not… I’m not going to go back and count them. The point is that there have been around 100 posts since embarking on this project. • As I already mentioned, it has been 167 days since my first post. Ya, ya, I know – my May 19th post was titled “Six Months…” Sue me, I can write or I can perform complicated mathematical computations – not both. • My hit counter will turn 4,000 visits within the next three or four days. Although many of those are my mom and dad (and I’m just tickled that they read my stuff – they never post any comments, but they are my biggest fans!) and plenty are “drive-bys,” many spend a considerable amount of time viewing my blog – and the trends are ever-increasing. Additionally, I have started two new blogs. The first is called Overflow and contains what its name implies – extra stuff that I didn’t want to post on The 25 Year Plan because it would burry the previous post before I was ready to take it out of the spotlight. Yet, I still had a need to post it so it wouldn’t die in the dark. Hence, Overflow was born. It has the freedom to grow into just about anything, but right now it emulates my main blog in its content. The other, This is Fiction, is a departure for me. It is an attempt to tell a story based partially in real life (mine and other’s) but with the freedom to embellish and fabricate details as necessary. This blog represents risk-taking and stepping outside the box like nothing else. I have posted two installments so far – both components of the same story. I don’t know yet how it’ll unfold – if those posts are the beginning, middle or end. It should sound somewhat familiar to some of my regular readers, but it important to remember that I do not represent any of it as fact. Sure, some of it is, but in its entirety, none of it is. I still don’t consider myself a “real” writer. I know I write well and I know that I am not a professional writer (although I will be when I start getting paid for it). To me, a “real” writer is either sitting in a noisy newsroom pounding on a typewriter or on the quiet deck of an isolated mountain cabin. A beachfront bungalow works for me too. He, or she is lost in brilliance as the words virtually write themselves – the author living through each tantalizing moment. Me? Not so much. It’s not the setting but the attitude – the romanticized, cinematic vision of magic flawlessly flowing from an author’s fingertips. For me, it’s an excruciatingly painful journey to achieve the impossible – perfection. No matter how much I like what I write – and I like most of it initially – the more I re-read it, the more I find wrong with it. It’s not just typos, although they drive me batty too. It’s about flow. I want the reader to be able to just float over the words and know. One hundred and sixty seven days ago, I didn’t know much about much. I still don't, however, I have stumbled onto a vehicle that has given me the means to discover more about myself than I ever dreamed possible. It’s more than just the writing, I think. It’s the sharing. There’s a certain authenticity that comes from allowing others to peer inside my soul. It’s cleansing and freeing. Indeed, six months ago, I would not have been capable of writing, let alone posting anything in the genre of fiction. In my archives, there are a number of posts that deal with my motivation to start blogging. If taken at face value, one would think that there was not much “chance” involved. It would appear that I had a desire, knew something about the medium and set out to experiment with it. And although that is not a false impression, it is not the whole story. As with so much else, I feel that “fate” or “luck” or “divine intervention” or “coincidence” played a role as well. While growing increasingly bored between my first and second semesters (winter break – five weeks) of my junior year, I decided that I needed to do something to keep me writing. It was motivation I was looking for, although I’m not sure I realized it. One of my journalism professors has a blog, From where I Sit, that I discovered by following links from the school and the department. He did not disclose it to his students – it was not used as a teaching tool. It happened to be on Blogger. I decided to follow the “get your own blog” link and the rest really is history. Would it have happened anyway? Who knows? It’s the feedback that kept me going. Early on, it was pretty sparse, but as time wore on and I commented on other blogs, people began to read mine – and comment on it. I’ll say this: I get just as excited about reading a new comment as I did about that first one. I now have a group of regular readers (you know who you are) and it’s growing all the time. Some have moved on or otherwise gone away, but the blogosphere is like any other world and that’s life. Recently, I have been participating in a blog, Sweet N’ Saur, that deals with local governmental issues in Pinellas County, Florida. I find the energy there invigorating – talk about citizens getting involved! I have been lucky enough to have something to add to the ongoing conversation and have applauded their efforts and encouraged their continued discussion as well. This is real, tangible evidence of community involvement in government and it makes a difference. That’s pretty much all I have to say – I’ve reached my 1,000ish word limit, anything else I may have to say will only be repeating what can be found in my archives. Thanks to all, keep coming back! Neighborhood Watch & Post #100!! 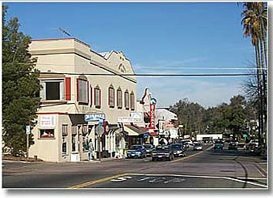 Fair Oaks, California is a sleepy little community on the eastern edge of unincorporated Sacramento County. It borders the American River, the Nimbus Dam and it’s reservoir - Lake Natoma. Its better-known neighbor, the city of Folsom, is just to the east and upstream. Folsom is much like Fair Oaks except bigger in every way. 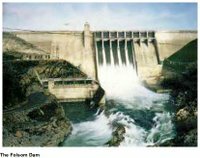 A bigger dam (Folsom Dam), a bigger reservoir (Folsom Lake), both banks of the American River, a larger population and geographically it is larger both physically and politically, as Folsom is an incorporated city. Nonetheless, the two municipalities are quite similar and share a common heritage. Folsom has attained recognition not only from its very real and appealing physical qualities, but also from its landmark, Folsom Prison, made famous from the movie “Walk the Line.” Fair Oaks holds no such infamy. Although both Folsom and New Folsom prisons are a very short distance, the crime rates in Fair Oaks, Folsom and the surrounding areas are not exceptionally high. Indeed, when paroled, the former inmates are taken far from here. Fair Oaks is about as economically diverse as an upper middle class community can be. Within it are pockets of very upper middle class homes. I have lived in such a neighborhood for exactly one year to the day. It is, by all accounts, a very safe neighborhood, especially in light of the fact that it is not a “gated” community. There is a homeowner’s association, but no amenities and very low fees. Fees that, as far as I can tell do nothing but pay to administer the collection and management of those fees – but that’s a rant for another day. The point is that my neighbors are not used to crime in their backyard. Until recently. Last week there were two home invasion robberies in this area. They were the real deal – not just bored kids throwing eggs. The bandits were armed, physical, bold and dangerous. Although the victims were not severely hurt, the potential was there and it was real. Both amusing and sad, the ramifications are already apparent. My neighbors are acting kind of funny. They are getting more neighborly. Yesterday, while writing in my office (just adjacent to my front door), someone came up to my front door and slipped something into the handle. Then he left - no bell, no knock, no cordiality – and I was obviously home. I opened the door as he was on his way down my driveway off to the next house. It was then that he explained the nature of the flyer and if I had heard the news about the crimes. He thinks it would be a good idea to get a phone list of the neighbors in the immediate area and maybe watch out for each other. He lives very close and across the street, the last two digits of his address are 36 – mine are 43. It was the first time I have ever seen this man in my life! When I opened my front door this morning to get my newspaper, a woman was jogging past the front of my home. This is a common sight around here. This time, however, there was an obvious and ominous difference. In addition to her water bottle, she carried with her - tucked under her left arm with her hand clasped around the end – a Louisville Slugger. That’s right, a baseball bat. I don’t think she was on her way to play baseball! In and of itself, maybe just an anomaly, but it triggered other heretofore disconnected observances that are now starting to make sense. There are notices posted on every pole in the neighborhood. Warnings, descriptions, what to do, who to call – these were not put up by law enforcement but by residents. There is a genuine fear that this could happen again and it has ignited a call to action – it has forced the kind of neighbors that are used to keeping to themselves to talk to each other. What a concept! Although the motivation may by purely selfish, this kind of safety net can only be accomplished through cooperation. To meet a self centered ends – individual protection – a community means must be employed. They have to talk to each other. And I am smiling to myself. You see, they already had my cooperation and didn’t even know it. I have been watching out for them since I moved in – even that next-door so and so that I can’t stand – even her. I am home more than most; I write from an office that has two very large windows facing the street; I am observant bordering on nosey. Those punks that committed these crimes would be begging for the police if they fell into my sphere of influence – and all my neighbors (except one) haven’t a clue. The irony is this: Until these crimes were committed, I was the one they were worried about. A longhaired, tattooed, motorcycle riding non-conformist was the bane of their existence. I don’t look like them and I knew it coming in. I’m ok with that; I am certainly not hurting for friends. I think, however, that I may have personalized the ambivalence. It would appear that none of my neighbors know each other. Could it be that in the quest for the good life, while striving for ever increasing levels of safety and comfort that they have left those very elements secured by the community behind? Perhaps they are only now realizing that they can’t do it alone.